CHOCTAW (June 11, 2018) – Richard Boone spent his career training young airmen on handling emergencies both in the air and on the ground. Now, after 26 years in the Air Force, the retired senior master sergeant calls teaching real-life skills to 13-year-olds his dream job. 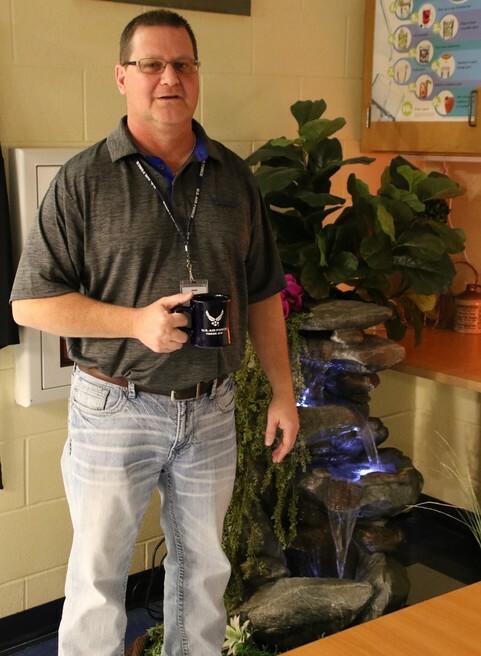 Boone found his path from Tinker Air Force Base to nearby Choctaw Middle School through the Troops to Teachers program, a national organization created to place veterans in classrooms. Thanks to a $1.2 million federal grant awarded this spring to the Troops to Teachers program at the Oklahoma State Department of Education (OSDE), Oklahoma hopes to see an influx of former military personnel pursuing second careers as schoolteachers over the next five years. Troops to Teachers streamlines the teaching certification process for anyone with a military background wishing to transition into K-12 public education. Through the program, veterans are eligible for certification testing fee waivers, reduced certification filing fees and more flexibility in meeting professional development requirements. The grant will enhance the program’s efforts to recruit and train military personnel to fill a growing number of teaching vacancies, a result of Oklahoma’s severe teacher shortage crisis. During the 2017-18 school year, the Oklahoma State Board of Education issued 1,975 emergency teaching certifications, compared to just 32 in 2011-12. One of the OSDE’s main strategic goals is to significantly reduce the need for emergency teaching certifications by the year 2025. Jon Parker, program coordinator of Oklahoma Troops to Teachers, said military personnel are trained to be leaders and teachers. Parker said retired veterans, like Boone, are a natural fit for the classroom because organization, confidence and self-discipline – all qualities vital for effective teaching – are characteristics instilled in every serviceperson, regardless of military branch. “I hear Richard’s story quite often. He put in his time. He thought he was ready to retire. He thought, ‘I’m going to kick it at the house, do some chores, do some projects,’ but then he realized he’s not ready. He’s got to stay busy, he wants to stay active and he’s already developed a love for teaching,” Parker said. Soft ambient light and a cascading waterfall greet students each day as they file into Boone’s family and consumer sciences classroom at Choctaw Middle School. Antiques influenced by his travels around the world adorn the walls the cabinets. Boone, whose unexpected career change to a class that used to be known as home economics turns more than a few heads, designed this relaxing environment with reduced stress and heightened learning in mind. He values effort, participation and teamwork over testing. “A lot of times in here I’ll put kids together and I’ll get, ‘I don’t like Johnny’ or whatever. But this is a real-life class. Sorry, but you’re going to have to work together,” Boone said. Boone organizes each class much like a small squadron, dividing students into groups to conquer tasks they might face in the real world. One of the first lessons his sixth-graders learn is how to cook an over-hard egg sandwich. “They’re going to cut it in half, and there should be two color yellows in there. But it’s more about the team. Can you communicate? You put the egg down; you put the toast down. Who’s buttering? Who’s cutting? Are you all working together? It’s the teamwork. That’s your grade,” Boone said. Boone has seen success building confidence and enthusiasm in his students by treating them like young adults and challenging them to take on more responsibility and independence. “On day one, they’re kind of scared. Cracking the egg, they’re really timid. Then the second day their learning curve is straight up. They say, ‘Hey, I cooked this,’ and they start practicing at home, and they cook their families eggs. It just explodes. They say, ‘Mr. Boone, I cook breakfast for myself now!’” Boone said. Boone, who was nominated for his school’s Teacher of the Year honor in his first year of teaching, isn’t strict. In fact, his students describe him as having an easygoing temperament, but he does have high expectations and brings a self-disciplined approach to his class. Five times a year, he requires students to deep clean the kitchen. Students scrub the corners of every cabinet and drawer, and produce them for inspection. In addition to instructing students on cooking simple, economical dishes, Boone is always looking for lessons on values and ethics, and he focuses on real-life skills, including balancing a checkbook, sewing on a button, addressing an envelope, interviewing for a job and buying a car. Lillian Shumway, a seventh-grader, aspires to be a chef and says Boone’s well-managed class has made her feel more independent. “I think his having Air Force connections makes him able to control the kids better. He’s just better at teaching the curriculum than what we’ve had in the past. I enjoy his class a lot,” she said. It’s been 15 years since Jennifer Leck last wore the uniform of a U.S. Marine, but when she entered an Oklahoma classroom for the first time in October, she leaned heavily on those values that the Marine Corps instilled in her during her three-year enlistment. “When I think about a Marine, I think about someone who is motivated, disciplined – honor, courage, commitment – and being true to what you believe in. You’re not going to give up. You’re going to do what you need to do no matter what. Just having that motivation and self-discipline, that’s what I need to push through,” Leck said. 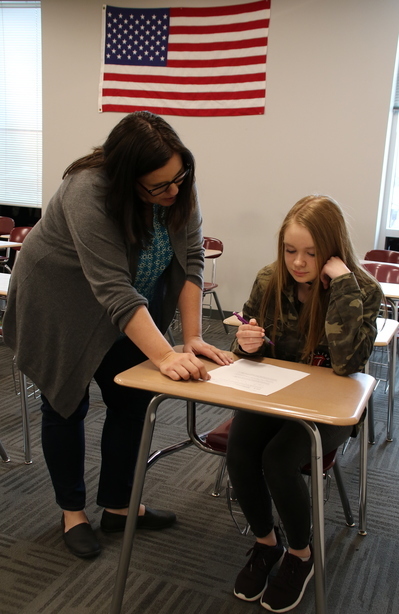 Tuttle High School was in dire need of a geometry teacher midway through the year before the Troops to Teachers program connected Leck with the school. Principal Pat Ragsdale said he is thrilled with Leck’s performance and is quick to point to strengths attributable to her military background, such as organization, self-discipline and professionalism. Leck, who trained fellow Marines to inspect Humvees as part of maintenance management operations in Camp Lejeune in North Carolina, always wanted to be a schoolteacher but instead pursued a sociology degree and went on to work with children in trauma at the Department of Human Services. Now she is calling on her life experiences to pursue her true calling in the classroom. “This is the first job I’ve ever had that I look forward to every day,” said Leck, who makes a two-hour round trip commute from Piedmont. Not many of Leck’s students know she was a Marine, but the ones who do are impressed. They have also responded to her teaching style, one that is rich with encouragement and allows students to learn at their own pace. Much like Boone, Leck incorporates the importance of camaraderie into her classroom. Leck may be new to Tuttle High School, but she is already popular with both the kids and teachers. On this day during lunch, a boy eating Hot Cheetos peered in her classroom seeking questions to a math problem. Other kids drop by just to talk. Carolyn Rowbottom, a fellow math teacher at Tuttle, said Leck has picked up the curriculum quickly and has developed great relationships with her students. With the addition of the $1.2 million grant to Oklahoma Troops to Teachers, Parker’s goal is to place 70 new veterans in the classroom by fall. But he’s not stopping there. Beginning next summer, through a partnership with the University of Central Oklahoma, OSDE will host a Professional Development Summer Institute exclusively to incoming Troops to Teachers participants. This weeklong teacher boot camp will include a focus on curriculum development, data-driven decision making, formative assessments, collaboration, differentiation, the Oklahoma Academic Standards and other areas to sharpen pedagogical skills. “We want to provide a customized support structure to our servicemen and servicewomen entering this new field,” Parker said. “Data shows us the earlier we can provide specific training on how to educate young people and adapt to the demands of the school environment, the more effective that training is, allowing our new teachers to hit the ground running in August,” Parker said. The grant will broaden Troops to Teachers’ partnerships with several state agencies. The Oklahoma Department of Veterans Affairs will continue to help identify future educators in the state. Meanwhile, Oklahoma’s Office of Educational Quality and Accountability, which is responsible for the development and implementation of educator certification tests, will help provide a resource library filled with study guides, practice tests and relevant college-level textbooks for multiple subject areas. For more information on Troops to Teachers, visit www.sde.ok.gov/sde/troops-to-teachers. PHOTOS: Richard Boone took his teaching experience from the Air Force as a senior master sergeant into the classroom at Choctaw Middle School. He designed his family and consumer sciences classroom with soft ambient light and a cascading waterfall to help his students learn. 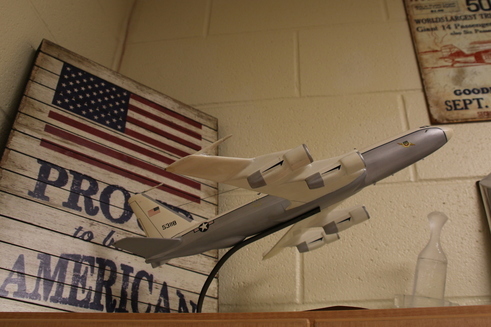 Richard Boone proudly displays patriotic décor in his family and consumer sciences classroom at Choctaw Middle School. Boone is a retired Air Force senior master sergeant turned schoolteacher. 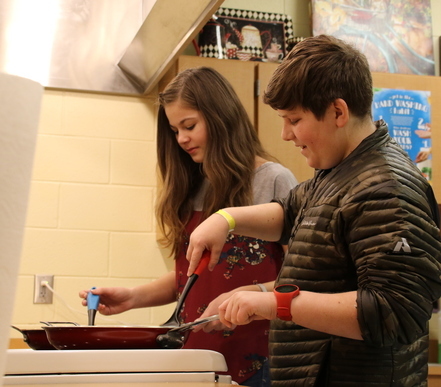 Seventh-graders Lillian Shumay and Jude Lewis learn to cook economical dishes like eggs and grilled cheese in the family and consumer sciences classroom at Choctaw Middle School. Their teacher Richard Boone is a retired Air Force senior master sergeant. Jennifer Leck helps Ally Cannon with a geometry assignment during her planning period at Tuttle High School. Leck, a former Marine, found a new career in the classroom through the Oklahoma Troops to Teachers program.